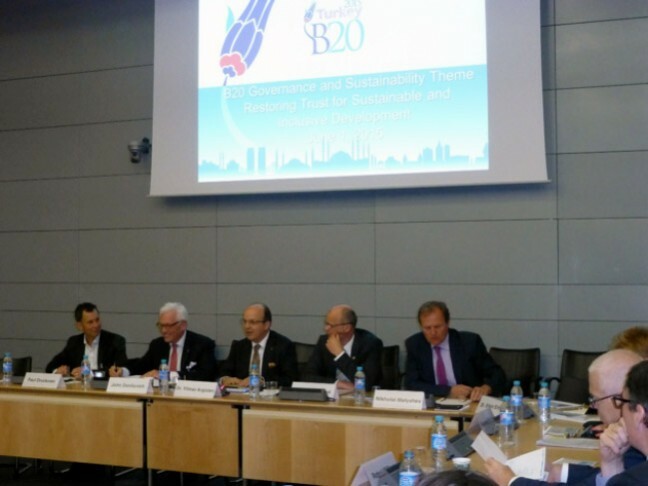 B20 has brought together critical stakeholders in Paris to prepare ‘Governance & Sustainability’ recommendations to G20 Leaders to be presented at the November 2015 G20 Summit in Antalya. 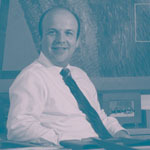 Dr. Yılmaz Argüden, Chairman of ARGE Consulting (B20 Knowledge Partner) moderated the session. 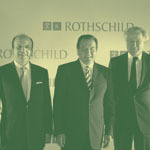 Speakers included global figures such as John Danilovich, International Chambers of Commerce (ICC) General Secretary; Sir Mark Moody-Stuart ,Chairman of UN Global Compact Foundation; Nikholai Malshev, OECD’s Head of Regulatory Division; Paul Druckman, Integrated Reporting CEO; and Stefan Embled, the World Bank Group’s Special Representative to the OECD and Director Europe. Paris, June 1st, 2015 – G-20 Leaders’ Summit will be held in November 15 -16, 2015 in Antalya Turkey. B20 will prepare recommendations that would be helpful to find solutions for global business issues. This year B20 Turkey Secretariat decided to form a new Theme “Governance and Sustainability” since 2015 marks a milestone year in which UN will establish Sustainable Development Goals (SGDs) and the Climate Summit to be held in Paris will be another milestone event related to global sustainability. 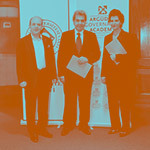 ARGE Consulting has been selected as the Knowledge Partner of the Governance and Sustainability Theme. ARGE Consulting is the only Turkish consulting firm to become a B20 Knowledge Partner. 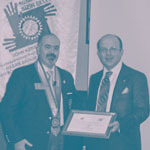 ARGE has a global reputation on governance related subjects. Workshop has been organized in OECD Headquarter Paris in June 1, 2015. Workshop has been started with panel discussion moderated by Dr. Yılmaz Argüden, ARGE’s Chairman. Speakers in the panel are; Sir Mark Moody- Stuart UNGC Foundation President, John Danilovich ICC General Secretary, Nikholai Malshev OECD, Head Regulatory Division, Paul Druckman Integrated Reporting CEO and Stefan Embled World Bank Group Special Representative and Director Europe. The role of principled business practices in building trust and achieving inclusive and sustainable development were the focus of discussions. Multi-lateral institutions participating in the discussion emphasized the importance of disclosure and transparency on reporting business performance in the areas of environmental, social, and governance spheres. The participants who were key business representatives from the G20 countries that participate in B20 Task Forces had opportunity to state their views after panel discussion. 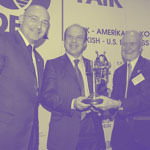 ARGE has been represented by Dr. Yılmaz Argüden, Ms. Pınar Ilgaz, and Dr. Erkin Erimez.